International fashion retailer bonprix wins the “Personalization Award 2015”. This tribute has been paid by international real-time analytics specialist prudsys AG for best practice personalization models. The award ceremony took place at the prudsys personalization summit in Berlin. On 29 and 30 June numerous blue-chip companies met up at the prudsys personalization summit 2015 in Berlin, where they discussed business scenarios for ensuring an individualized approach to customers. Technological innovations were described in over 20 presentations made by companies such as Coop, Douglas, 1-2-3.tv and bonprix. They also provided an insight into the potential offered by intelligent real-time analysis and the future of omni-channel commerce. This event was additionally the stage chosen for fashion retailer bonprix to receive the “Personalization Award 2015”. 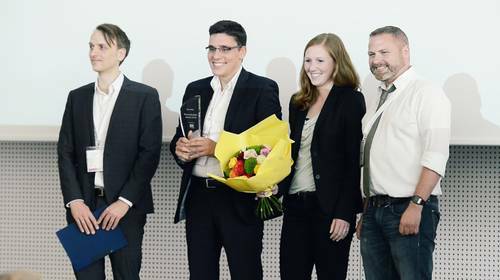 This Hamburg-based company impressed the four-strong judging panel with its innovative, customer-oriented and personalized real-time customer approach in its online shop and newsletter. prudsys AG and bonprix have been cooperating since 2009. Today bonprix uses the high-performance personalization software prudsys RDE in numerous countries to address users with a customized approach via various channels. bonprix is a pioneer in the field of personalization, above all where its newsletter is concerned, and consistently comes up with creative ideas for further optimizing its campaigns. https://prudsys.de/wp-content/uploads/2016/10/personalization-award_1.jpg 280 500 Denise Linge https://prudsys.de/wp-content/uploads/prudsys-logo-rgb-homepage-213x88-2018.png Denise Linge2015-07-02 11:57:402017-08-31 11:22:41Top rating: bonprix wins "Personalization Award 2015"